I’ve been to London many times before but I’ve always been aware of the exchange rate and so was quite careful about how much I spent on food. This trip was a little different as Virgin Atlantic gave me a budget along with strict instructions to investigate the food scene in London. So that is exactly what I did. I used the Virgin Atlantic London City Guide app to choose some restaurants and others I selected on advice from friends and foodies. There were also some random restaurant experiences which were well worth reporting on. My previous 2 reports on my London trip are here and here, these are the highlights of my London food experience. I’d heard about the Kensington Roof Gardens and was super keen to check them out. 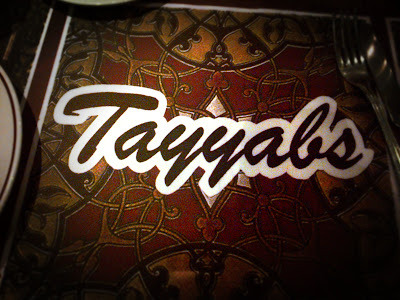 The fact that they are owned by Virgin now made it a great fit so I decided to have dinner at the restaurant, Babylon. The gardens were lovely and we had a drink at the bar with a fantastic view over London. The modern looking restaurant ties into the garden theme with different shades of green contrasted against patterns and solids. There is a glass wall to ensure the view is available to diners. Babylon is a very upmarket spot, somewhere you go to celebrate a special occasion. The prices are very high and the food is good, but it’s not what attracts people. We didn’t have starters, and I ordered fish (halibut) for mains while my dining partner ordered pork belly. We were both very happy with the food, the ingredients were obviously high quality. It was well prepared and beautifully presented, but nothing exciting. I had a glass of wine with my meal, while my dining partner stuck to water as he was driving. We ordered some beans and potatoes to go with out mains and we also had dessert, chocolate cake and cheesecake. 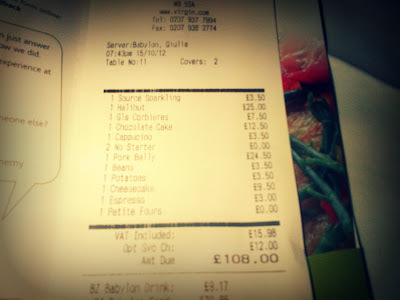 We split the bill and it was £55 (about R800) each! This was a definite highlight. Opened in 1994 by chef Fergus Henderson, who was one of the early proponents of nose to tail eating and is renowned for serving offal and other neglected cuts of meat. Many chefs eat at this restaurant which is a good sign. It’s located in an old smokehouse and has an interior as understated as the exterior. The unpretentious interior is confident and comfortable. The focus is on the food which doesn’t disappoint. I opted for a selection of starters in order to try more dishes. The most interesting dish was the dried salted pig’s liver with radishes and boiled egg (£6.80), it was very tasty and the radishes were different from the ones we have here, much more subtle. Roast bone marrow with parsley salad (£7.20) is a dish they are famous for so I had to try that and it was great. 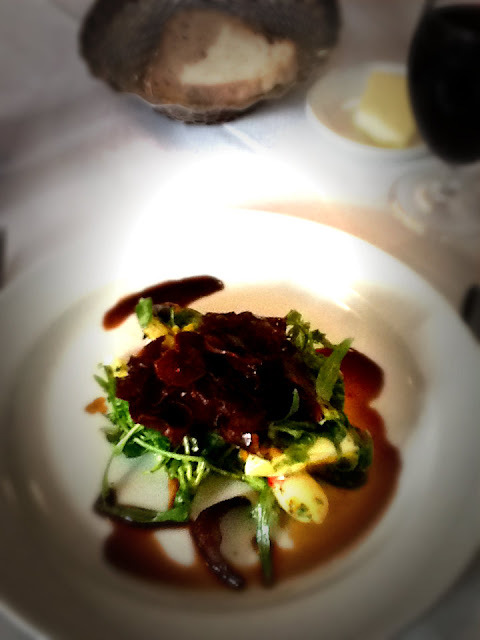 The parsley salad provides a lovely fresh flavour to break the richness of the marrow. I was keen to try the cockles, leeks & lava bread (£7.60) but thought I should try something lighter so went for the beetroot, red cabbage & creme fraiche (£6.30) instead. The bright red, white and green stand out on the plate as they arrive separately, then you have great fun mixing them all up. 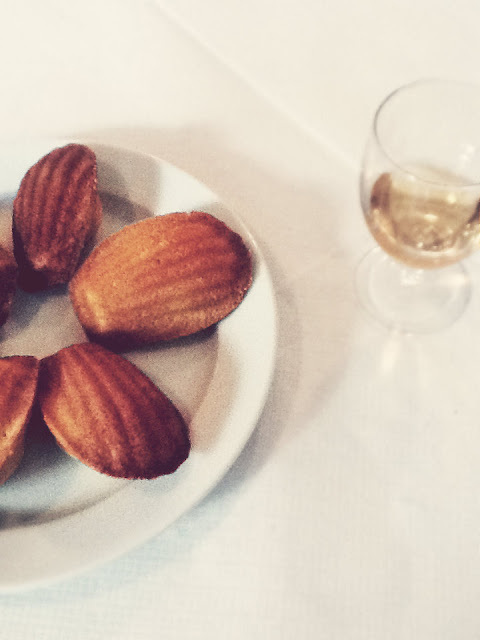 I ended with the madeleines (£4.20 for 6) which was a very good idea. There were 6 on the plate, I thought I would have one or two as I was quite full by then. I ate all 6, they were amazing. So simple, yet so good. Yum! Time for a more casual option. Chicken Shop has been dubbed Nando’s for hipsters and it’s about right from what I could see. A very cool underground restaurant. No really, it’s underground, underneath Pizza East (both part of the Soho group. There are several Pizza Easts around London and they are the most awesome pizza spots ever) in Kentish Town. 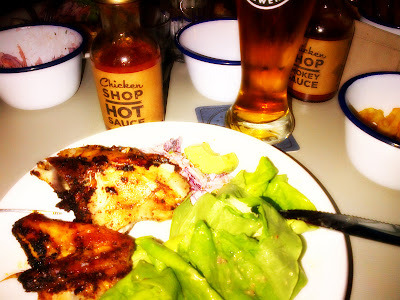 They offer just rotisserie chicken (choose between hot or smokey) and sides like corn on the cob, chips, salad and coleslaw served in tin bowls. The food is great, not complicated and not expensive. 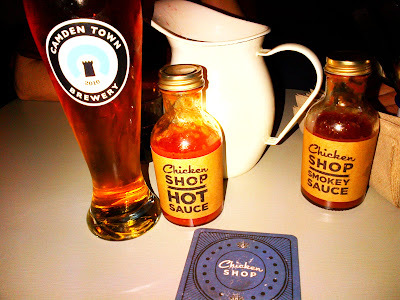 Tasty in-house chilli sauce and a small selection of good beers and wines make this a solid offering all round. There were three of us so we ordered a whole chicken (£14.50) and one of each of the sides (£3 each). 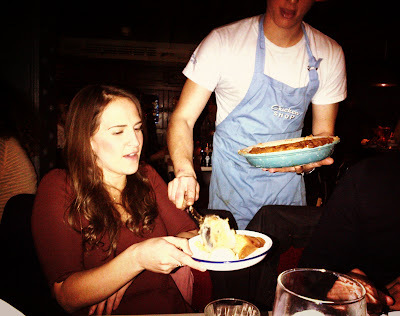 Dessert (all £4) was pretty special, they bring apple pie in a big pie dish and serve it at the table. I had the cheesecake, both were fabulous. I reckon this concept would work well in SA. We love chicken. London has some great Spanish tapas bars, and I’m half Spanish so I had to try one out. Brindisa was recommended by a friend so I thought I’d give it a go. There are several Brindisa tapas bars around London now, and they have an amazing Spanish food store at the Borough Market too. All the waiters are Spanish and the food is really authentic, so it has a proper Spanish feel. I ordered pimientos de padron (£5.60). You should try these if you ever get the chance. Fried peppers, but not like any we have here. They are light and tasty and there will be one or two on the plate which are chilli hot but the rest are ‘dormant’ so it’s really cool if you like surprises! I ordered sardines (£6.80) which were served deboned, not the way I like them but they were delicious. The croquettas con jamon (£6.90) were fantastic. I was in 2 minds whether to have dessert as well but I decided to go for it and it turned out to be the highlight of the meal (the lesson is always have dessert. You’re welcome!). I ordered the crema Catalana with ripe figs (£5), like a creme brulee custard over ripe figs and they also caramelise the sugar on top. Delicious! Some people say the national food of England is actually curry. So I had to have at least one curry experience. A friend took me to this Pakistani curry house which is in Whitechapel. It’s BYO only, so we picked up some wine from Tesco’s on the way. The place is huge and it was rammed. We had to wait in a queue for about half an hour before getting a table. I don’t think they could squeeze another table in there if they tried (I’m sure they’ve tried). The website describes their offering as ‘fine Punjabi cuisine’, and the food was indeed great. 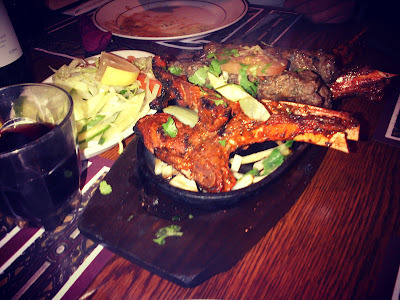 We shared a portion of lamb chops and seekh kebabs for starters. 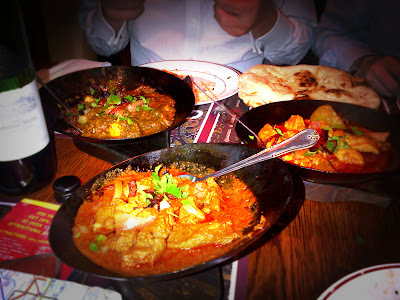 Then we each ordered a different curry for mains and shared them around with a couple of rotis to mop up that delicious sauce. It was all so tasty and our final bill was £10 each! Compare that to the food prices I’ve shared with you so far. My trip to London was sponsored by Virgin Atlantic. Click the banner below to find out more about their daily flight direct from Cape Town to London.